Take a trip into the mountains and stay at the Alpine Lodge. The cozy lodge has a den furnished with a fireplace, countertop, and eating area, as well as a patio for those wishing to enjoy a meal outdoors. In the loft, there’s a warm place to sleep and a bathroom with toilet and sink. The balcony features gorgeous flowers and a great view of the mountains. Kids will also love the lodge’s barn, filled with animals including goats and cows. Set also includes four adult figures, one child figure, backpacks, walking sticks, playing cards, mattresses, tables with benches and chair, fencing, flowers, and other accessories. Price is 51% below the initial Playmobil retail price, a € 28.30 discount! 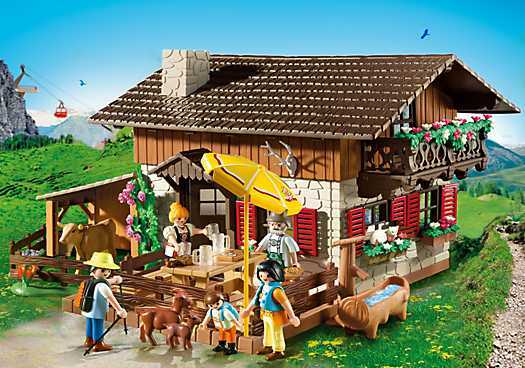 The Alpine Lodge (5422) Playmobil set is no longer directly available from the sites below. However, 3rd party partners of these sites might still have the set available.